Target has released an interactive, in-store mobile experience for the holidays. 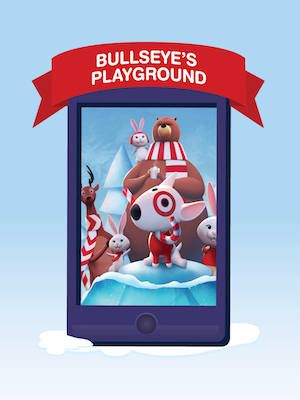 “Bullseye’s Playground” is a series of mobile games including sledding, ice fishing and snowball fights. Users can play the games on their mobile device and then unlock characters and new game levels with their mobile phone in-store. For every game played, Target will donate $1 to St. Jude Children’s Research Hospital, up to $1 million. Target partnered with Google’s Art, Copy & Code project to create this interactive experience. In four selected Target stores, guests can also try out the Google Tablet to experience a 3D version of the game. Target is blazing the trail in the integration of in-store, mobile gaming and cause marketing with this cutting edge new interactive experience. Not only does this campaign showcase the future of the retail experience for consumers, integrating a sizable donation to a well-known cause further incentives participation, particularly during this season of giving. Smart, timely and innovative. How cool is that!! And to support St. Jude’s …. one of the best childhood medical facilities in the United States. Good job Target!